Car makers want in-vehicle electronic systems to provide a large number of energy-efficient functions in as little space as possible. Infineon Technologies AG supports this trend with its new power IC manufacturing technology SMART7. 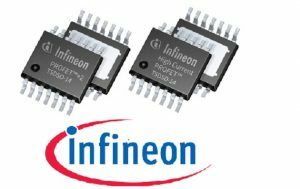 Infineon designed it specifically for automotive applications such as Body Control Modules or Power Distribution Centers. SMART7 power ICs drive, diagnose and protect loads in applications like heating, power distribution, air-conditioning, exterior and interior lighting, seat and mirror adjustment. They also provide a cost-effective and robust replacement of electromechanical relays and fuses. SMART7 is based on thin-wafer technology that reduces power losses and chip sizes. Based on SMART7, Infineon now introduces the two high-side power switch families PROFET+2 and High Current PROFET. The SPOC+2 multichannel SPI high-side power controllers will follow within a year. The PROFET+2 family was developed for automotive 12 V lighting load applications and capacitive loads. These comprise e. g. halogen bulbs in external lighting control, interior lighting and dimming, as well as LED lighting. PROFET+2 devices provide state-of-the-art diagnostics and protection features. They maintain pin-out compatibility with their predecessor family PROFET+ for zero-cost migration. 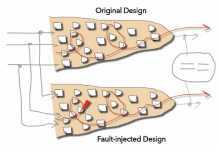 There is no ECU layout change needed, if single-channel devices are replaced by dual-channel variants and vice versa. Compared to theirpredecessor family, the PROFET+2 devices are up to 40 percent smaller in package size and improve energy efficiency with 50 percent lower current consumption. The lowest ohmic PROFET+2 device is the 8 mΩ dual-channel switch BTS7008-2EPA with protection functions and diagnosis. The new High Current PROFETs extend the flexible family approach of PROFET+2 to on-state resistances RDS(ON)from 8 mΩ down to 2 mΩ in the same TSDSO-14 package. A High Current PROFET in a TSDSO-14 package with pin pitch of only 0.65 mm offers today’s world-lowest RDS(ON) as a monolithic switch. Compared to established smart power switches in the DPAK package, the footprint of the TSDSO-14 is 50 percent smaller. Compared to D²PAK, it is 80 percent smaller. The family enables very efficient driving of high current loads. Also, it reduces power losses in control modules up to 60 percent. With its optimized feature set for 12 V high current loads, including diagnosis and protection, the family addresses a wide range of heating and power distribution applications. These comprise glow plug controller, PTC (Positive Temperature Coefficient) heater, starter relay, horn, trailer node, and auxiliary power outlet. Both families, PROFET+2 and High Current PROFET, are pin-compatible and share the main feature set. Their on-state resistance RDS(ON) scales from 2 mΩ to 200 mΩ. Their load current sense accuracy (kILIS) below 5 percent at a nominal current is benchmark in the market. Their protection features comprise current tripping, over temperature, overvoltage, load dump and reverse battery capability ReverSave™. 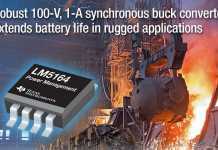 Infineon is first in the market to implement reverse battery capability in a monolithic chip. A further benchmark feature is a cranking voltage capability able to work down to 3.1 V.
The PROFET+2 device BTS7008-2EPA with 2×8 mΩ is released for mass production. Engineering samples of further switches in both families are available. Their mass production is planned to start as of Q4 2017 and later. All high-side switches will be qualified in accordance with AEC Q100.